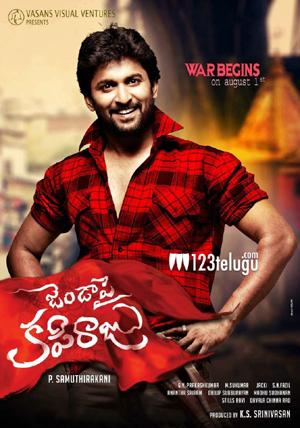 The shooting of Nani’s upcoming film Jenda Pai Kapiraju has finally come to an end. Recently, the last schedule of the film was shot in Hyderabad. Samuthirakani has directed the film and K S Srinivasan has produced it under Vasan Visual Ventures banner. Nani and Amala Paul have played the lead roles in this action drama. Earlier this week, Nani officially unveiled his look from this film, in which he’s playing dual roles. One of them is Aravind Shiva Shankar, who hails from Andhra Pradesh, whereas the other character is a Tamilian named Maya Kannan, who comes to Andhra Pradesh for a reason. Nani’s mass look as Maya Kannan has received terrific response on social media. Kannada actress Ragini Dwivedi has played an important role in the film and she has also shot for a special song with Nani. G V Prakash has scored the music. The film is expected to release early next year.